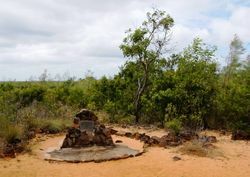 A cairn commemorates the lost camp (Camp 84) of the Edmund Kennedy expedition. On 29 April 1848 Edmund Kennedy and his men sailed out of Sydney Harbour in the barque Tam O' Shanter in company with the survey ship HMS Rattlesnake, for the journey to Rockingham Bay. On the 21st of May 1848 the sailing ship, Rattlesnake, landed at Tam O'Shanter Point on the Southern side of Mission Beach. On the 24th May 1848 explorer Edmund Kennedy and his party started their disastrous trek to Cape York. 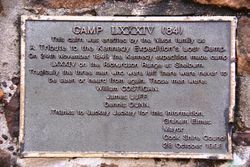 On 24 November 1948 the Kennedy expedition made camp LXXXIV (84) near Shelburne Bay. Three men were left here as they were unable to continue due to illness or injury and they were never seen or heard from again. All but three members of the 13 man party were killed and Edmund Kennedy himself was speared to death at the base of Cape York. 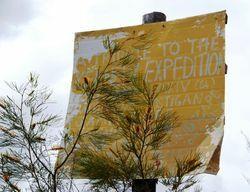 A Tribute to the Kennedy Expedition`s Lost Camp. LXXXIV on the Richardson Range at Shelburn. Thanks to Jackey Jackey for this information.